F. D. Roosevelt is the biggest state park in Georgia, and one of the most historic as the former American President Franklin Delano Roosevelt personally looked over the construction of it. The park is filled with some excellent hiking trails with the 23-mile long Pine Mountain Trail being the longest one. There are 14 more miles of walking trails throughout the park and it has a stone swimming pool that’s spring-fed. Roosevelt discovered the natural beauty of the region in the 1920s as he headed to Georgia to seek a cure for the polio he had contracted. He felt Pine Mountain would make an ideal spot to place a park on and his wishes came true. Campers and hikers from all over America are thankful as the park has something for people of all outdoor interests. The park is home to 140 campsites, 22 cottages, several picnic shelters and group camping areas. The park lies close to the charming town of Warm springs and Callaway Gardens. It’s filled with a good mix of trees such as pines and hardwoods. The highest peak of the Pine mountain Trail reaches about 1,400 feet and the mountain itself is located in the southern edge of the famous Appalachian Mountains. The park is open to day visitors between 7am and 10pm. It’s just over 9,000 acres in total size and is home to two lakes, Lake Delanor is 15 acres in size and Lake Franklin is 25 acres. There are 14 back country sites for those who’d like to be more secluded in the wilderness. There’s a playground for children and a trading post for supplies and other amenities. F.D. Roosevelt State Park is an excellent location for hiking, backpacking, boating, fishing, birdwatching, picnicking, and horseback riding. You can rent a horse and explore the miles of trails. 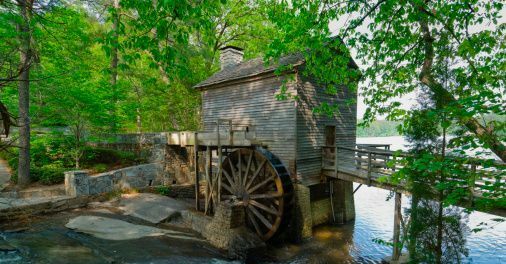 There’s plenty to do in the park and the surrounding area has several interesting spots such as Columbus, LaGrange, the Roosevelt Little White House Historic Site, Warmsprings Village, Sprewell Bluff State Recreation Area, the Wild Animal Safari, and West Point Lake.